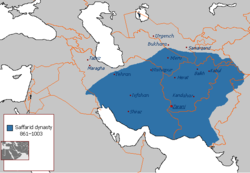 The Saffarids or the Saffarid dynasty (Persian: سلسله صفاریان‎) was a Persian empire. They ruled in Sistan from 861–1002. Sistan was a historical region in southeastern Iran, southwestern Afghanistan and northwestern Pakistan. Their capital was Zaranj, located in present-day Afghanistan.